"You should not go on this ride if you are pregnant, have a history of back or heart problems, or can't fit in the boat." This cracked me up. It's an ever-enlarging world, after all. of Dualravens for linking to my Reformation Sunday post. Patrick's blog is among the most thought-provoking and interesting ones I read. At first, a new regimen of work, which included administering a number of monasteries, pastoring a local church, and teaching at the new university, did nothing to assuage Luther’s loathing of God and of himself. But then, something happened to change Luther’s life and world history. (And, over time, through the Reformation Luther began, my personal history.) 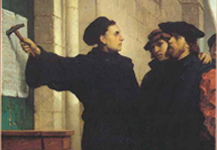 Like most seminarians and priests of his day, Luther had never studied Scripture. He did so now, as he prepared for the classes he was teaching. 1Seavey was a brilliant, humble man of God. A former president of Boston College, with a doctorate in Economics, Seavey volunteered in his retirement years to pastor a parish in Alaska, where there were severe clergy shortages in the Roman Catholic Church. He was instead sent to Michigan's northwestern lower peninsula, where he served faithfully and I was privileged to meet him. 2When Luther first issued the 95 Theses, he had not yet fully concluded to side with Scripture over against the traditions of the Church of his day in repudiating the very existence of purgatory. That's reflected in a number of the theses. 3Throughout the 95 Theses, Luther really let the Pontiffs of his day "off the hook." He doesn't ascribe indulgences to the popes. Rather, he suggests that they're an abusive practice which, if the Pope knew about them, he would quickly shut down for being un-Biblical. Kathryn Kleinhans says that Luther may simply have been giving the Pope an out, a face-saving way of repudiating the indulgence practice, not to mention a way for Luther to avoid a frontal assault on Rome. In this, Luther was practicing what he would later preach in The Small Catechism. Explaining the Eighth Commandment, "You shall not bear false witness against your neighbor," Luther wrote, "We should fear and love God that we may not deceitfully belie, betray, slander, or defame our neighbor, but defend him, [think and] speak well of him, and put the best construction on everything." As Kleinhans points out, Luther didn't always take his own Biblically-founded advice, often viciously attacking those who opposed him. All of which just underscores the fact that the Church is composed of sinners in need of God's grace given in Christ!